Manila Water Foundation readies itself to respond to disasters by conducting a Mobile Treatment Plant training. Participants were employees of Manila Water Business Continuity Team, Clark Water, Laguna Water, Boracay Island Water, and Cebu Water in partnership with Power 4 All, local distributor of ODIS, Compact and Mobile Water Treatment System. 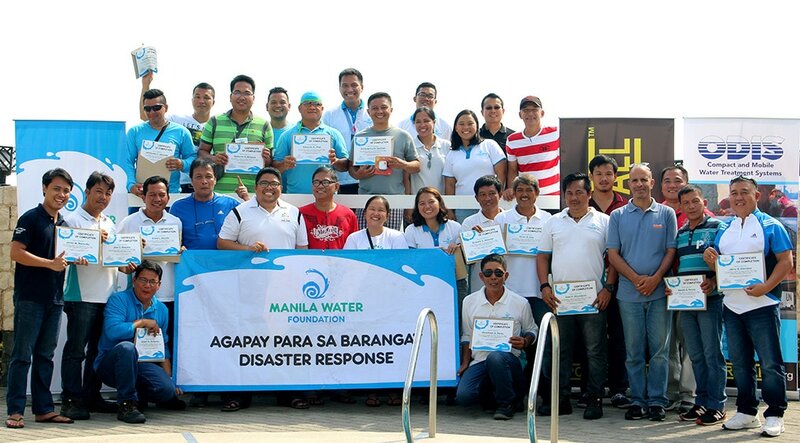 As part of its commitment to immediately respond to disasters, Manila Water Foundation (MWF) recently conducted a training aimed at equipping the technical teams of the Manila Water group to provide potable water for calamity-stricken communities in the Philippines. Under its Agapay Para Sa Barangay (APSB) program, MWF taught the participants how to operate a Mobile Treatment Plant (MTP), a transportable water filtration system that converts all types of water to its potable state. The training was conducted in Bataan and was participated by employees from Manila Water Business Continuity Team, Clark Water, Laguna Water, Boracay Island Water, and Cebu Water. The MTP operation is a critical procedure to ensure that clean drinking water will be delivered to the affected communities and evacuation areas where waterborne diseases due to unsafe water sources are common. The training will allow MWF to secure the need for clean drinking water during disasters and when prolonged support is necessary. Through the Php10 million donation of Ayala Corporation, MWF was able to acquire one MTP unit which will be stationed in Aklan under the care of Boracay Water. The unit will be ready for deployment should disaster strike in Visayas or Mindanao. Manila Water and its subsidiaries’ employees were trained to form MTP deployment teams as part of the Agapay Para Sa Barangay program. The trained teams are expected to lead the MTP operation during deployment in calamity-stricken areas. ​Aside from the deployment of the MTP, the APSB program also provides water relief by sending 5-gallon bottled water and solar bags, a mobile filtration system that uses sunlight to make water potable. As of 2016, Manila Water Foundation, through the APSB program, has provided clean water to over 40,000 families in various areas in the Philippines. The MTP can make all types of water potable. During the training, the group converted salt water to clean drinking water.